The sixth Mughal Emperor Aurangzeb Alamgir (1618 –1707) ruled for 49 years. The title Alamgir implied someone who would conquer the universe. He pushed the boundaries of the Mughal Empire further than any of his predecessors. The Mughals were descendents of Timur, who himself came from the line of Genghis Khan. Unlike most royal dynasties, which followed the right of primogeniture, in which the eldest son inherited the throne, the line of succession for the Mughals depended on the ability of the contenders to forge the allegiance of various factions. Often the contenders had a stark choice taktya (throne) or takhta (coffin). The rise of the third son of Emperor Shah Jahan came at the cost of the death of his brothers. Shah Jahan’s favourite son Dara Shikoh was defeated by the combined forces of Aurangzeb and Murad Baksh. Dara was executed by Aurangzeb in 1659. Thereafter, Aurangzeb turned against his ally Murad and had him tried and eventually executed for a murder he was alleged to have committed earlier. Shah Shuja, the third brother, was defeated by Aurangzeb’s army and he disappeared in Arakan in West Bengal, where he was probably murdered. The latest novel by Diana Preston and her husband, Michael Preston, who go by the nom de plume Alex Rutherford, however, opens with the dramatic scene describing an assassination attempt on Shivaji, and the Maratha leader’s subsequent attack on Surat. The pace is racy and we soon are in Aurangzeb’s court in Red Fort, Delhi, where he summarily deals with his defeated governor of Surat. The dramatic writing and the plot makes us turn pages as we follow the life of an emperor as he deals with the death of his father. The dialogue built around him and his sister Roshnara, in which he attempts to justify the imprisonment of his father at Agra Fort, gives a human dimension to a man widely seen as an oppressive ruler. The death of his father reunites him with his sister, Jahanara, whom he respected and loved. She was a sage adviser and a calming presence in his palace, someone whose approval he sought. How different they were! She was a moderate person, a Sufi, who was as accommodating of other’s views as he was not. We see her agitation at Aurangzeb’s decision to move away from the pluralistic and tolerant attitude of Emperor Akbar. He imposed the hated Jazia tax, and razed some temples to the ground. These actions, naturally, alienated the vast majority of his subjects, and contributed greatly to the ill-will among his Hindu allies and employees. The intrigues of the court come alive as we see Roshnara’s jealousy towards her elder sister, and the match between Azam, Aurangzeb’s son and the Jani, the daughter of Dara, his elder brother. The wedding celebrations are used to showcase the grandeur of the mightiest and the richest kingdom of its time. Even the ascetic emperor lets his guard down as he savours the dishes and enjoys the magnificence of his court and its courtiers. Yet matters of state demand eternal attention, and soon after the wedding, he is leading his army against jats who have attacked Mathura. The rebel leader, Gokla, is vanquished but not beaten, as he defiantly stands up to the Mughal emperor and denounces him, his bigotry and his oppression. Aurangzeb was puritan to the core. He was unforgiving towards those who drank wine, and even soldiers who he trusted with his life were not forgiven for this trespass. However, his sister, Roshnara, was said to have imbibed the spirits regularly, and even had lovers. The Aurangzeb that we come across is a complex character, fixated on expanding his empire and his version of Islam among his subjects. He is pious in his observances, but far from morals in statecraft. He uses guile, lies, spies, false promises and what have you. His machinations would get an approving nod from Chanakya. Through the book, we see a middle-aged man become frail, fighting memories of his harsh deeds and the collateral damage these caused. He seldom gets to enjoy the fruits of his conquests, and he is far from sure about his legacy or the longevity of the empire that he has forged with blood and betrayal. Traitors in the Shadows is a novel first and foremost, but one that makes history come alive. This has just arrived – the first of the Empire of the Moghul series in Russian! Heard on the radio this morning that two million people will visit the Calcutta book fair – what a great thing to hear from the city of Tagore! Trust no one…if you may! History has never been as readable – intriguing, engrossing and gripping! By weaving fact and fiction together, Alex Rutherford has brought the historical characters of the bygone era to life in his Empire of the Moghul series. 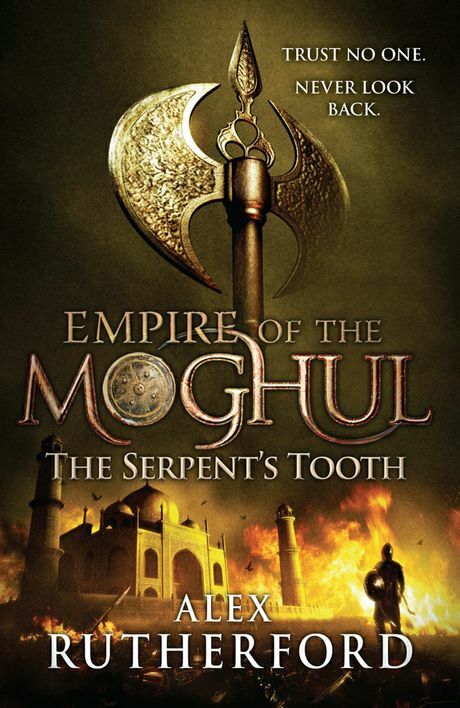 The Serpent’s Tooth is the fifth novel in the series, devoted to the reign of Moghul Emperor Shah Jahan who ruled over a colossally wealthy empire of 100 million souls in the early seventeen century. One can feel the presence of Shah Jahan as he swings his legendary sword alamgir in the battlefield; as he conducts court from rubies and turquisos studded silver throne; and as he spends romantic moments with his beautiful wife Mumtaz. Rutherford shows historical characters not just as names in dull history textbooks, but as people with emotions and passions, loves and jealousies, dreams and insecurities not too different from any one of us. Like his ancestors, Shah Jahan had to follow the savage ‘throne or coffin’ tradition to gain his throne. It goes without saying that through the Moghul history, brother had fought brother and sons their fathers for the throne, and Shah Jahan has been no exception. Shah Jahan had fought his brothers and half-brothers to the throne, his sons were no less ruthless and murderous towards each other. Caught in the crossfire, Shah Jahan had spent last few years of his life imprisoned in the historic Agra Fort. As he sat alone in the darkness he had wondered why there had been so much death and destruction within his family. What had the Moghuls done to deserve it? God had allowed them unbounded power and wealth but denied them the peace and harmony that even the humblest family had a right to expect. His name meaning ‘Ruler of the World’ had mocked him. Rutherford not only handles historical text with care but adds value to the narrative from his travels through some of the important landmarks of then Moghul Empire. The end product is a totally absorbing narrative, an amazing page turner. The characters are authentic and the actions are real, as one gets a ringside view of the shifting sands of politics, the tragic consequences of deceit, and the horrifying view of raw savagery. Rutherford makes the reader relive every moment, at time as an onlooker and at other moment as a courtier. The beauty of the story lies in the writing. In his impeccable style, Rutherford transports the reader into another world. So much so that this reviewer could not hold himself back from reading the previous four volumes in the series. The Empire of the Moghul has been full of colour and beauty, joys and tears, love and deceit set against the backdrop of a glorious period in Indian history. If you haven’t read Alex Rutherford; your lessons in history shall remain incomplete.